I’ve been brewing kombucha tea for a couple of years now and have given away more SCOBY than I can count. Kombucha tea is a great probiotic beverage full of beneficial yeast and bacteria. It has many benefits that range from improved gut health to increased energy. the whole family enjoys it as a beverage. My original SCOBY was a gift from a friend who I get my goat milk from (and hopefully some doe kids this spring). It is a very hearty strain! 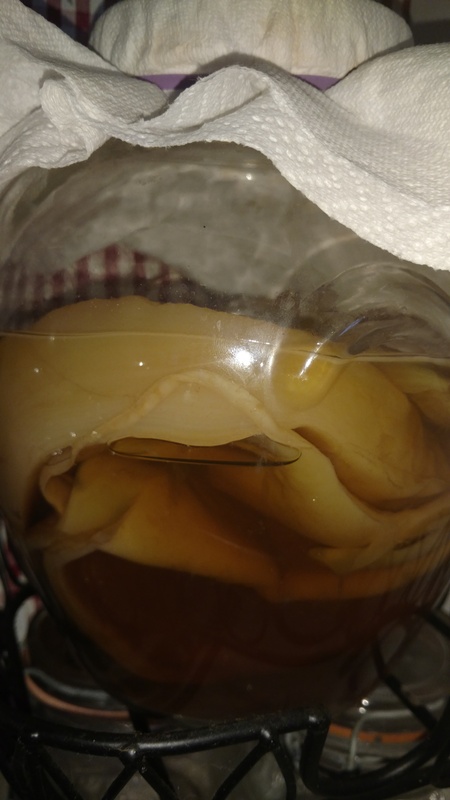 It takes a lot more abuse and neglect than any of my other fermented beverages (milk kefir and water kefir, click either to read more) and produces big fat healthy SCOBY’s for faster fermenting and sharing! You may be asking, what is a SCOBY? A Symbiotic Colony Of Bacteria and Yeast. It is the starter culture required to start making your own kombucha tea at home. It looks like a big mushroom or jelly fish, not very attractive. Really it is all you need to start brewing. You can buy one online at Cultures For Health or get one from a friend. Some people even have luck at making one from plain store-bought kombucha. Once you have a SCOBY, what’s next? 1 gallon glass container, to keep it in, with no metal parts touching it (long-term contact with metal can corrode and ruin your tea). It needs to remain at room temperature and out of direct sunlight, my kitchen counter works great.You will be watching the surface of your liquid for a skin to form. This is a new SCOBY baby forming. When it is about a quarter of an inch thick is usually a good time to taste test. Just pour some liquid off or ladle some out and taste it. If it is still too sweet wait a day or two and taste again. If it’s already too sour you will want to wait fewer days next time. Usually it takes 7-10 days on average. I have had new SCOBY form in as little as 3 days in summer. I’ve also had it take two weeks in winter. Temperature definitely plays a role. Everyone has a different taste preference so get to know yours by tasting daily when you start brewing. If it gets too sour don’t worry it is not a waste! Kombucha vinegar is delicious and it is just over fermented kombucha! It makes great salad dressing and marinade etc. Also, it makes a great hair rinse, leaves hair soft and conditioned. When it is done you can pour all off except one cup and start process over or do continuous brew and just add sweet tea to it as the level comes down. You can also do a second ferment where you can flavor it and add fizz! Just add fruit or juice to finished tea and cap it and leave a few more days to flavor and hopefully fizz. Fizzy ferments are usually from a good cap and added sugar, ginger seems to encourage fizz also! This makes a great substitute for someone giving up soda! There you go! Now each time you brew it again you will get a new SCOBY! Who will you share it with!? Don’t forget to subscribe to email updates so you don’t miss out on any new posts! Great post…keep up the good work!